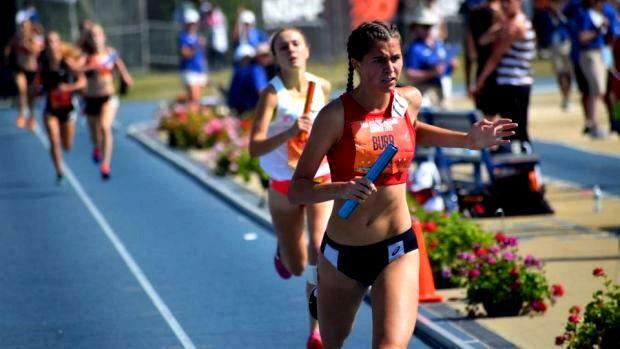 Rhode Island athletes earned six more All Americans on the final day of the New Balance Nationals on Sunday. East Greenwich's Connor Sheridan set a state record of 6,341 points to finish sixth overall in the Decathlon. Sheridan secured his All-American nod by finishing third overall in the last event, the 1,500m run. He was timed in 4:56.32. On the final day of the competition, Sheridan scored his most points (802) in the 110m hurdles where he was timed in 15.40. Gus Karweh of Central achieved a PB in the high jump by clearing 6-10-.25 to secure sixth overall. The Ocean State had four of its athletes claim All-American spots in the Hammer, led by Barrington junior Annika Kelly. Kelly finished third overall with a distance of 175-5. Central's Keyarsa Harris (fourth, 172-7), Classical's Cheyenne Figueroa (fifth, 164-6) and Barrington's Faith Polando (sixth, 162-6) also made it to the podium. Portsmouth's Nikki Merrill came a half second short of a state record in the 800m. Merrill was ninth overall in 2:08.90. La Salle's Joseph dos Reis just missed All American in the mile run. Dos Reis took seventh overall in 4:17.25. East Greenwich's Jeffery Pedersen was eighth at 4:17.51. In the 4xMile Relay, Barrington was eighth overall in the girls' race (21:20.18), while Bishop Hendricken was 11th in the boys' race (17:48.49). Westerly, the 1,600m EE Sprint Medley Relay winner, added its second relay win of the three-day meet by capturing the EE DMR in 12:06.47. Randi Burr (see above) anchored the relay with a PR of 4:59.39 for the mile. The Westerly boys secured third in the EE DMR with a combined time of 10:31.84.